Summer just got real, yo. Oh! We saw our first firefly last night. And by that I mean I was freaking out in a full-blown breakdown in our back yard watching a giant clumsy bat wobbling around in the deep twilight between two tall oak trees. And then as I finally settled down and calmed my breathing from nearly dying, I noticed a blip of yellow to my left. I screamed yet again and then realized it wasn’t a death dragon from the yonder abyss. It was just a firefly. Yay! I do love fireflies though. When I was young we used to tear off the little bu – you know what, it’s cool. And white queso on turkey burgers. This whole thing is pretty simple. I seasoned some ground turkey early in the day and then heated up some queso at dinnertime as I seared the burgs. And the queso is seriously anything you want. I’m not even going to tell you what mine is. Okay I’ll tell you. It’s like a block of Velveeta, but pepper jack! But it’s like, our store brand. Disgustingly wonderful. But what you m.u.s.t. do is garnish errthang with blue corn chips and fresh jalapenos. If you don’t do this your basement will be haunted by the clumsy drunk bat from my sky for the next 22 years. In a large bowl, combine the turkey, cilantro, garlic, onion, egg, panko and spices (including a pinch of salt and pepper). Using your hands, divide the turkey mix into four patties. Cover and chill as long as you want. When ready to eat, bring a Tbs. of olive oil to a medium-high heat. Add the patties and cook until nice and seared on both sides, and the meat has cooked through, probably 8 minutes total. Heat the queso in a small crock pot or sauce pot or whateves. 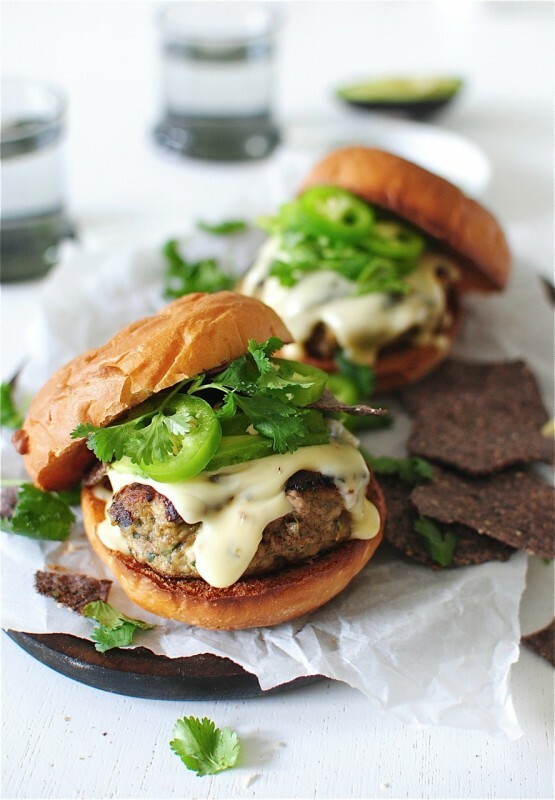 Serve burgs smothered in queso and piled high with crunchy chips, spicy peppers and fresh cilantro. Man oh man. I do love fireflies though. I've never had white queso before; it looks delicious! Sweet mother of burgers, I need this in my mouth. Those buns look SO GOOD. Where are they from? They're egg buns from a local (KC) bread company called Farm To Market. SO GOOD. COME TO MOMMA. Queso on a burger? Heck to the yes! the buttless firefly comment made me laugh out loud! we used to do that too! hahaha! Yummy!!! Green and full of nutrients. Love this burger!! 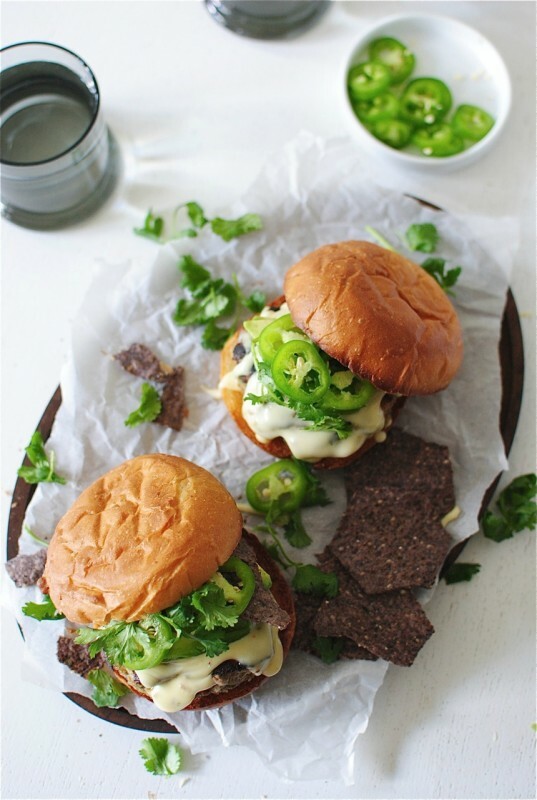 I love that you just added queso to a burger. How in the world have we failed to think of that until now!? WOW, these look good. Love all of that queso...and fireflies! Not only did I rip the butts off of fireflies, I then smeared their butts all over my body so that I glowed. Like radioactive poop. Awesome. As for the queso, dude, the white velveeta is the best. For serious. Love these burgers! I did, too! Nails and ears. Gross. But awesome. Firefly's still make me swoon! Love a good burger! This one looks good! I've been seeing SO many fireflys in the last week -- officially summa! 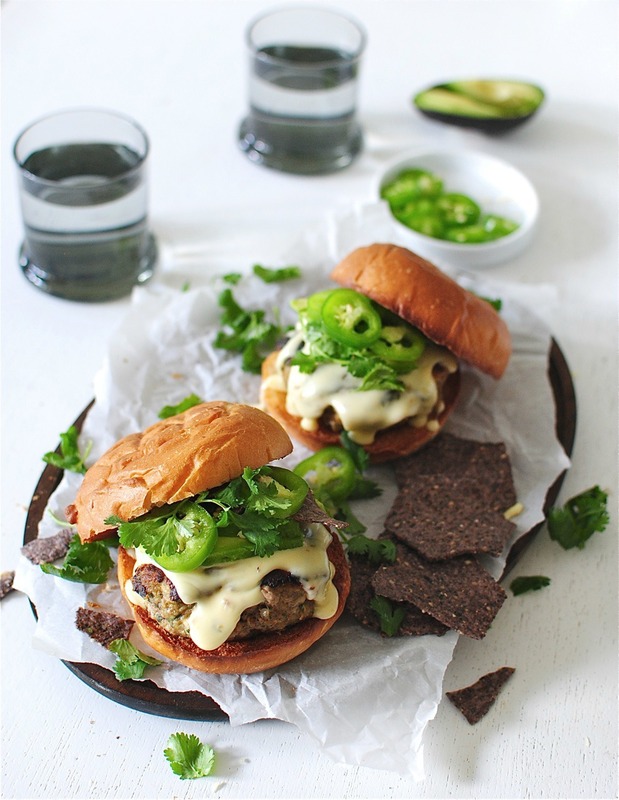 Mucho burger love to these!! Bev, you make me laugh every time- and these burgers look wonderful. 'Nuff said. This turkey farmer approves! Those look so good! We used to tear off their butts and make jewelry out of them. So weird. Also, we'd catch them in jars and put them on our nightstand for all-night long night lights. Kinda cruel, weren't we? I just saw my first fireflies this weekend. I was in love. Then I saw a little boy trying to catch them. He failed many times. More love from me though. QUESO. legit throw queso on anything and I will give you a giant internet hug. I used to rub firefly butts on my pants. I'd draw stars and hearts and then my pants would glow. Apparently we were horrible kids. Made these last night, and oh wow -- the whole family loved them. 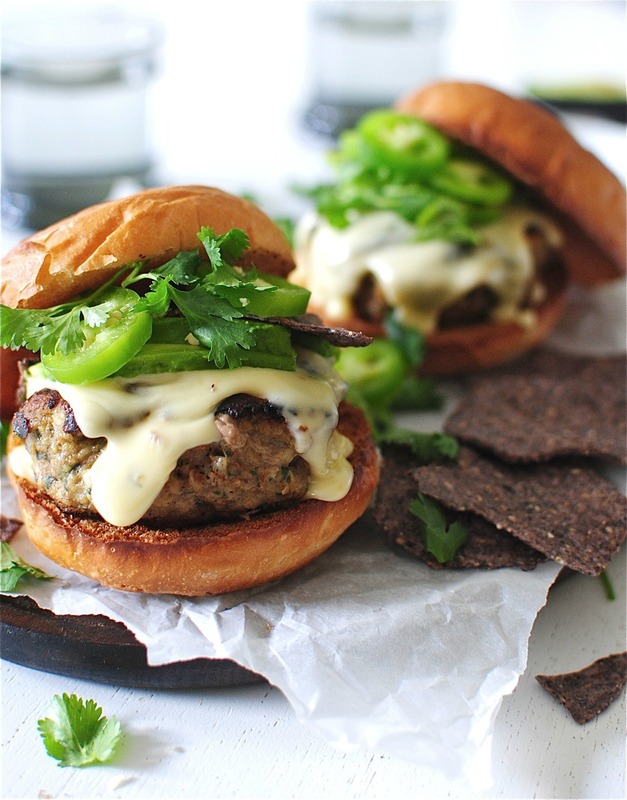 I'm a sucker for queso, but the turkey burgers themselves were also stellar. Thanks for the great recipe! Bats scare the living bejeezus out of me. You don't get much better than this. Love these summery burgers! bev! I'm full into this whole exhausted and starving breastfeeding mother deal and all I crave are sandwiches and burgers so I can prepare one thing and be completely full. I made an Indian spiced turkey burger but needed some more ideas and this looks delicious! I love the chips and fresh cilantro on top...I may be tired but still need the food to look pretty ;) These are gorgeous. ps, once, in my youth, i was having a sleepover with my bff. and we were in bed and outside the window we thought for sure we saw...A BAT. and we were squealing and clinging to each other and afraid to look but we had to check and blam, THE BAT, rinse, lather, repeat x100. dang, that bat was persistent. until of course, we realized it was actually the shadow of a neighbor's flag in the wind. Thanks for this recipe it was a tremendous Hit in my house. Always good to have another alternative to cook turkey,and this one should be in everyone's bag of tricks. Again thanks from Michigan. PS we have the best Fireflies ?